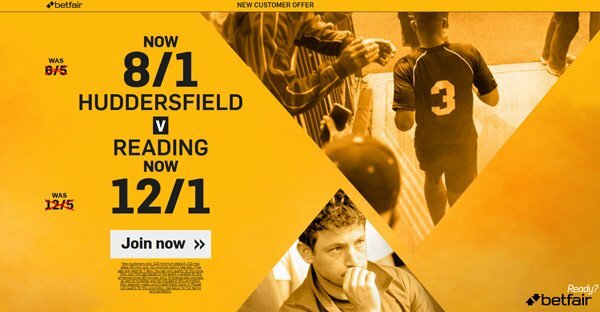 Huddersfield and Reading go face to face in the Championship Play-Off Final on Monday and Betfair Sportsbook is offering a huge chance to make money on the final game of the football season! Find here how to claim 8/1 Huddersfield to win or 12/1 Reading to win, plus money back if you lose! Will Reading end their exile from the Premier League by beating Huddersfield Town on Monday? Will Reading return to the Premier League by winning the Championship Play-Off Final in 90 minutes? Don't miss your chance to get enhanced odds on the match! Read here how to boost your profits at Betfair! Place your first bet (max £/€10) on Huddersfield or Reading to win Monday's Championship Play-Off Final match! If your bet is a loser, Betfair will refund your stake. • Max stake £10. Only the win part of Each Way bets count towards promotion. We will payout your winnings ENTIRELY IN FREE BETS within 24 hours IF your bet is successful. Free bets are valid for 7 days. • Winning Example: Enhanced 12/1 x max £10 = £100 paid in FREE BETS plus £10 qualifying stake returned as CASH. 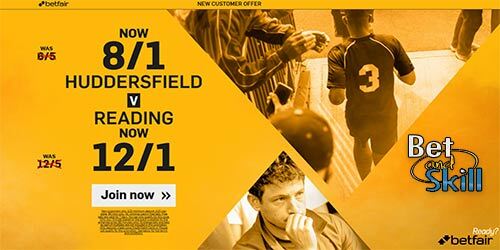 "Back 8/1 Huddersfield or 12/1 Reading to win at Betfair (Championship Play-Off Final offer - 29.5.2017)"